Wild strawberries are some of the most beautiful and delicate fruits I know of. Their taste is a little different, but I happen to like the taste. I am somewhat jealous! I will take 2 portions please! Thank you Sue. You are most welcome to as much as you like. I hope to pick more and preserve them. How lovely. I’ve never heard of olive oil in ice cream but I imagine it tastes beautifully creamy. I remember always picking wild strawberries when I was young. There was a ravine behind my house where I spent hours foraging for things -fiddleheads, wild strawberries, pine cones, flowers, puffballs, wild apples. I don’t think the strawberries ever made it home! Mine rarely make it home either. Making a recipe for Fiesta Friday was a good incentive to save some. The olive oil ice cream seems quite common in olive oil countries, so there are lots of recipes for it. I found it surprisingly good – creamy as you say but with a slightly nutty taste. Thanks Arl. It is yummy but wish I had more. this looks lovely Hilda…..fresh strawberry sauce with icecream hmm droooooooooling…. Thanks Chitra. Either part of the recipe is good on its own – but together is a winning combination I think. Thanks so much. I’m glad you found the idea as interesting as I did. I just had to try it and not sorry I did. How interesting, when one hears olive oil and balsamic in the same sentence, one thinks of a salad. With this recipe, you took me out of a box, and introduced me to this wonderful dessert! Thanks Fae. Like so many things, when you think you have a totally original idea you find it really isn’t all that original. Olive oil ice cream is quite common in countries like Spain and Italy, and of course balsamic strawberries have been added, but at least my recipe was original. I will work on the ice cream part some more because it really is delicious. This recipe is very intriguing and interesting :). I know it sounds unusual, but the combination is really delicious. What an intriguing recipe Hilda! Love the creativity! Thanks Catherine. I don’t usually bother with wild strawberries as they are so tiny, but just couldn’t resist making at least one recipe with them. I’m sure regular strawberries would be good too. Hilda, It looks very appetizing and I like the addition of balsamic vinegar into the strawberry sauce ! Wow, Hilda! You always surprise me with your wonderful, creative recipes! Fabulous that you have olive oil and balsamic in a dessert! Just so wonderful with the wild strawberries! 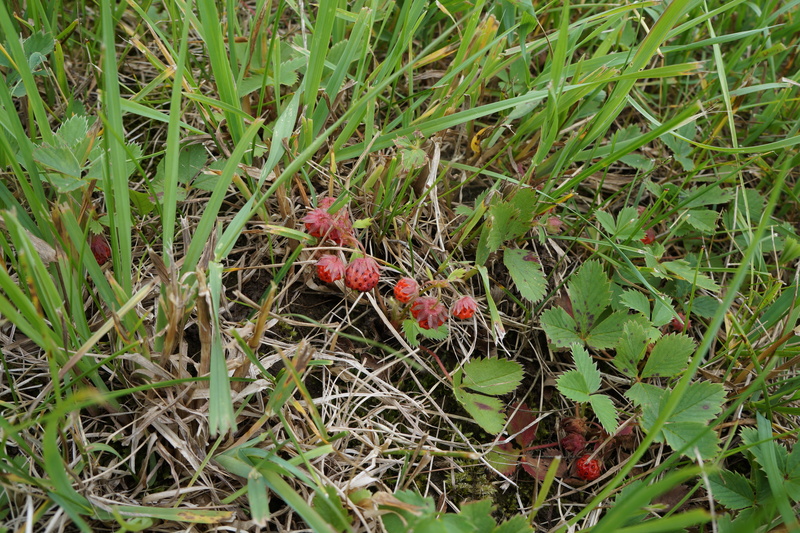 We occasionally had wild strawberries in our yard when I was little. What a thrill it was to find them! If the apocalypse hits, I’m coming to live with you (just warning you now). I’m amazed at what you whip up from wild edibles. Thanks so much. Let’s hope it never comes to that, but you are welcome to share my stash if it should. Wow, wild strawberry! You always bring something interesting and wonderful from your garden! I’d never had olive oil ice-cream, but sounds like good combination with balsamic + strawberry. Not as intense as I thought it would be. Actually, just a little nutty and very creamy for some reason. I will try other recipes with it, and other flavours just to see how far I can take it. It does seem to be very popular in Italy and Spain, so you know it can’t be bad. I love the farm-to-table concept . You are blessed to have access to such fresh food. I am envious of you. The jam looks delicious! Thanks Suchitra. It is wonderful to have plants right at your doorstep, so I try and make good use of them. But I also want to make recipes that other people can use, even if they don’t have the same things available as I do – so in this recipe, strawberries would work too. Olive oil icecream, how exciting! I can imagine that it goes very well with the fruit & balsamic mixture (a combination that I love, it’s great with raspberries, too). Thanks for the inspiration, Hilda!